This would be very easy to paleo-fy. Just leave off the cheese! I’m allowing dairy back into my diet, because I don’t have an allergy! YAY! Would you like to know something about me? As a kid I absolutely loathed green bell peppers. If they were in the room, cooked on a pizza or worst of all…stuffed with meat and rice, I would have a melt-down. “They stink! I hate them…they ruin everything! !” I would scream and cry….even then I was passionate about food. Needless to say I would never eat them. Beth, being the ever gracious hostess, apologized profusely. “That’s right. I’m so sorry, Kel. I forgot. I’ll make you something else for dinner.” She really was a best friend, and that moment made me feel really well loved. When dinner was served, everyone was enjoying their porkchops and Beth presented me with my special personal plate. 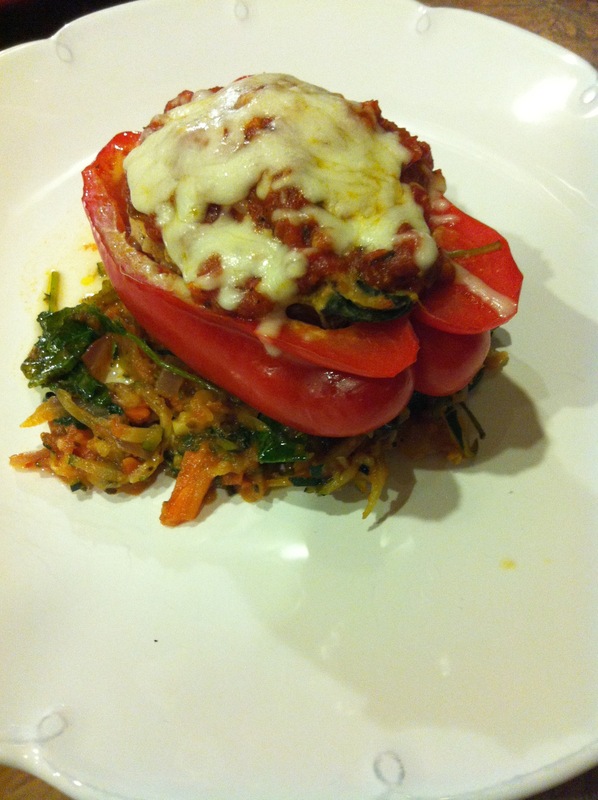 A garden fresh green bell pepper….stuffed with tuna salad. “I picked it from the garden!” she beamed. I nearly died, and I didn’t have the heart to tell her that I loathed green peppers, not after declining the pork chops. So I did what any burgeoning foodie would do. I ate it. Every last bite and it, and I complimented and thanked my chef, and you know what happened? I grew to love bell peppers. The lesson here. Confront your food fears friends. You never know what untold joy lie in a freshly picked green bell pepper. I will admit that I still prefer red peppers and that brings us to tonight’s creation: Bell Peppers Stuffed with Awesome Sauce! 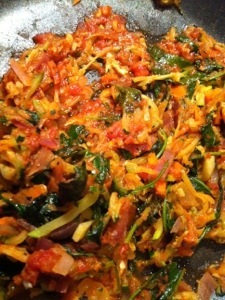 Awesome Sauce….grated zucchini, onion, grated carrot, garlic & baby kale wilted in olive oil with 2 tsp of mustard and 1/2 cup or so of tomato sauce….seasoned with s&p! 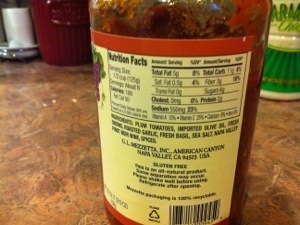 1/2 jar tomato sauce: I used Mezzetta Roasted Garlic and it was delicious!! It also has no junk in it! Normally I make my own sauce…but I was feeling lazy and this looked delicious! 1. In large saute pan heat 1T olive oil. Add onion and garlic and sweat for a few minutes. 2. Add zucchini, carrots and kale (or spinach). Cook for 5 minutes. Stir occasionally. 3. Season to taste with salt and pepper. Add mustard. Add 1/2 cup of tomato sauce/pasta sauce. 5. Evenly distribute meaty goodness into halved stuffed peppers. Bake at 375 for approx 45 minutes, or until meat is done cooking (internal temperature of 160*). 6. 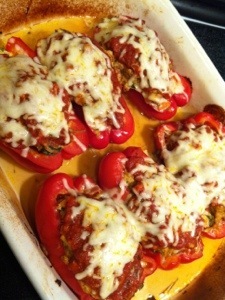 Remove from oven, spoon tomato/pasta sauce on topof peppers and sprinkle with mozzarella cheese. Bake another 5-10 minutes, until cheese is melted. 7. Serve bell peppers on top of a little bed of Awesome Sauce.